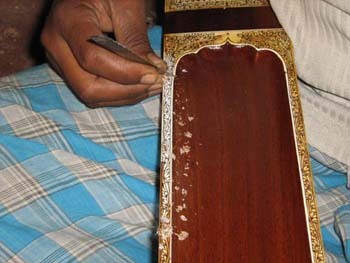 When sitars and other instruments are french polished, the whole body is done after the penwork has been finished. Then, areas where there is penwork are carefully scraped before the rest of the instrument is finished. If you look at your own instruments, regardles of maker you'll see little marks where they scraped a little bit too much!